The new model range extension from the MINI is big. Really big. Huge. If the new 5 ended up at a circus, there'd be no point in using it as a clown car, it wouldn't be funny. Because there's nothing funny about shoving five people in a five-door Mini. This isn't the first five-door Mini we've been given. The Countryman also has five doors. However, the new 5 is the first non-off road offering in this form. So just how huge is this new extension? We already knew this was coming, but we didn't know the extent of the size increase. Now we do. The press release on the BMW Group website gives us all the deets on the latest example of embiggening (best word ever?) the MINI silhouette, albeit with all the self-congratulating which usually goes into press releases. Just imagine it in an upper-crust British accent, just don't blame me if you end up in a giggle fit. 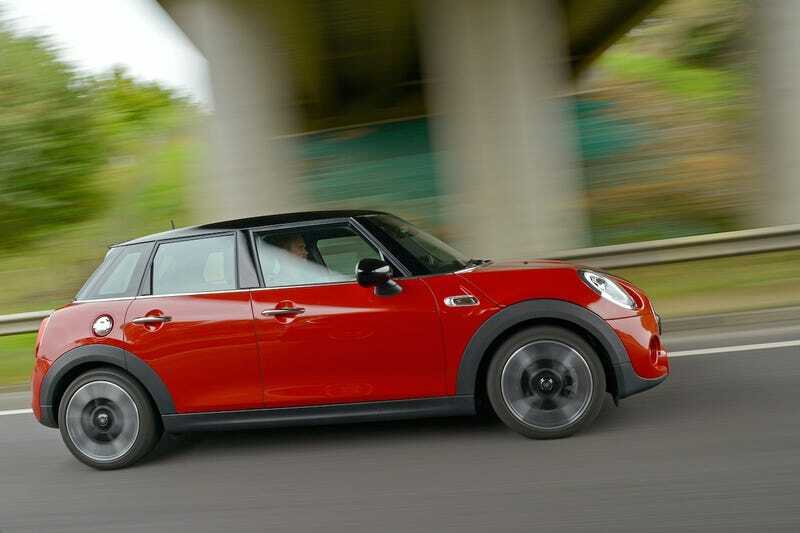 Wheelbase expanded by 72 millimetres as compared to the new MINI; this makes space for three seats at the rear of the MINI 5 door with 72 millimetres more foot space and legroom, 15 millimetres more headroom and 61 millimetres more interior width at elbow height as compared to the new MINI; what is more, luggage compartment space is now at 278 litres - 67 litres more than in the 3-door model; excellent figures in the small car premium segment in terms of legroom, headroom and luggage compartment volume; rear backrest with 60 : 40 split; optional storage package including luggage compartment floor which can be locked into place at varying points. For the exterior the length has been extended to 3.982 meters (4.005 meters for the MINI Cooper S 5 door and MINI Cooper SD 5 door), widened to 1.727 meters, heightened to 1.425 meters, and the wheelbase has been increased to 2.567 meters. This is one honking large "Mini."